Protesters walk during a rally to encourage the release of President Donald Trump's tax returns on Saturday, April 15, 2017, in Palm Beach, Fla.
Berkeley police arrested at least 21 people during a pro-Trump rally that became violent after counter-protesters clashed with demonstrators on Saturday. Thousands of Americans turned out in cities across the country Saturday — April 15, the traditional deadline for filing federal tax returns, even though this year's deadline is actually Tuesday, April 18 — calling on President Trump to do something every president has done going back to Gerald Ford: release his individual tax returns. As a candidate, Trump said he wouldn't release his tax returns because he was being audited by the IRS. When pressed on the issue as president, he's said he doesn't think most Americans care. In New York, Chicago, Los Angeles and dozens of other cities, protesters observed the traditional tax filing deadline by marching and calling on the president to release his taxes. 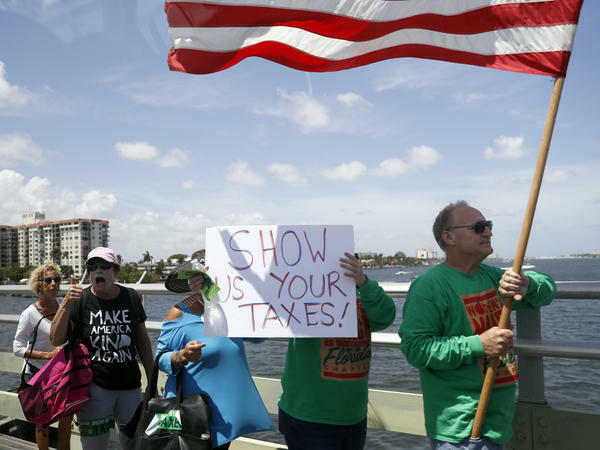 In West Palm Beach, Fla., Robert Saplin was one of several hundred protesters who marched along the Intracoastal Waterway to a bridge just a few hundred yards from the president's private club, Mar-a-Lago. Reacting to the president's assertion that Americans don't care, he said, "We definitely care. We want to know where that essentially unlimited deduction has been coming from all these years. It seems like he's getting away with ... not paying his fair share. And there's all this talk about Russia and conflict of interest." Trump may have seen some of the protesters Saturday as he went by car from Mar-a-Lago to his golf club in West Palm Beach. The president is spending Easter at the resort — his seventh visit there since being sworn in. 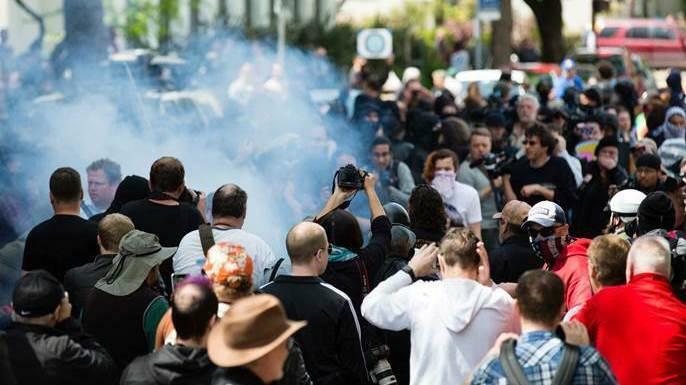 In Berkeley, Calif., KQED's Bert Johnson reports at least 21 people were arrested when protests in a park spilled out into the city's streets and led to violent clashes between pro- and anti-Trump groups. Berkeley police told NPR there was some property damage and that numerous projectiles had been thrown, including fireworks. Some garbage bins were also set ablaze during the skirmishes. Service by the Bay Area's BART train was also affected with delays at least temporarily in the system in the East Bay area. Johnson reports that 11 people were injured, according to police. At a rally in Washington, D.C., Democratic members of Congress said they'd keep the pressure on the president to release his tax returns. Rep. Maxine Waters, D-Calif., said there's nothing that prevents the president for releasing his taxes but, "The simple truth is he's got a lot to hide." Sen. Ron Wyden, D-Ore., said, Americans have "a basic right to know whether the president pays his fair share." Senate Minority Leader Charles Schumer, D-N.Y., has said the president's refusal to release his tax returns could undercut his push for a tax overhaul. Voters, Schumer said, "are going to say, 'Oh, he's not doing it because it's good for me. He's doing it because it's good for him.' So, for his own good, he ought to make them public." Saturday, the Electronic Privacy Information Center filed a lawsuit against the IRS for failing to release the president's tax returns in response to a Freedom of Information Act request. In West Palm Beach, some of those protesting said Trump's election as president had mobilized them to become much more politically active than ever before. Dan Baker, a retiree from Boynton Beach, Fla., said, "I've always been a passive person. I've never been out before. I've always said everything will take care of itself. I think that this time we just have someone who doesn't keep his word. I finally had enough and said I have to do something." Others at the march said they'd been out protesting almost every weekend since Trump was sworn in. Lisa Saunders and Brittany Patterson said they were active with the local chapter of Indivisible, an anti-Trump group. But they weren't optimistic the national protest would spur the president to release his returns. "No," Saunders said, "but maybe it will spur Congress to force something to be done about his taxes," Patterson said. "And if they don't, we'll be paying attention on the upcoming elections. They're happening very soon." NPR's Brakkton Booker and Eric Westervelt and KQED's Bert Johnson contributed to this report.